Fire name, location, map orientation, and other incidents in the area. Fire Weather (previous, current, and expected) including changes in winds, temperature, RH, cloud cover, and significant events. Fire Behavior (previous, current, and expected) times and thresholds for active behavior, significant spread, and flame length issues. Identify and explain the key inputs and assumptions that frame the analysis, highlight the primary conclusions, and describe the limitations and uncertainty that limit your confidence in the information provided. WFDSS analyses allow the analyst to associate Notes sections with every input section of the analysis and in support of the final disposition (accept/reject). However, even informal briefings should document the basic assumptions, the expected fire behavior, and the implication for management decisions. The primary reason for conducting fire behavior assessments is to support decisions. Decisions occur in an environment of uncertainty, and involves choosing a level of risk to avoid, to mitigate, and to accept. All Incidents in WFDSS provide for maintaining an updated Relative Risk Assessment and a dependent Organization Assessment. Both are shown here. A Probability Assessment from Time of Season, the barriers to fire spread, and current/expected seasonal severity. A Hazard Analysis from fuel condition, current fire behavior, and potential fire growth. 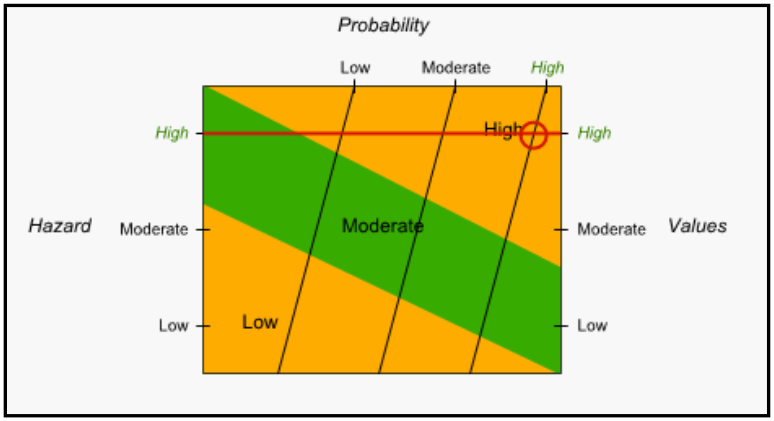 An assessment of Values at Risk based on fires proximity and threat values, identification of cultural and natural values, and Social/Economic concerns. These include the relative risk assessment, an evaluation of difficulty implementing the incident strategy, and a factor for the socio/political concerns for the incident and the values at risk. Provide additional justification and validation of the decisions and actions associated with Management Action Points, resource allocations by Geographic Areas (GA), Management Area Coordination (MAC) groups, and individual agencies. They should reinforce the relative risk and organization assessments mentioned above. An enumeration of values at risk. Reference Fuels, Climatology and Fire Behavior/Growth history as base line for current situation. A description of the current situation as it differs significantly from the reference conditions above. Expected fire behavior and growth based on analysis and judgment. Include statement of assumptions, limitations, and uncertainty in the analysis. Anticipated impacts and effects based on the fire analysis. Conclusions in support of the relative risk assessment. The fire has spread outside the planning area or outside the contours of the FSPro analysis used in the assessment. The planning area is expanded. Unexpected fire behavior is observed on the incident. There weather forecast and outlook basis used in the assessment have changed significantly or expired. The analysis horizon for the fire behavior outputs has expired. The fire behavior narrative is an important document that captures key fire behavior information for the incident. It is often summarized (executive summary) for the final incident package. It is a dynamic document that is driven by the incident, the fire behavior, and analyses performed. It is a standard component of a fire behavior documentation package. This may include representative RAWS sites, assumptions/limitations specific to the incident, local observations, or other relevant information that assisted with your analysis and interpretation. Heading with Incident Name, Period of Record, and Author. Chronology of Fire Behavior Events. Fire Behavior inputs and outputs specific to BehavePlus or model used. Worksheets (completely filled out with times and dates). Index of runs and names. Maps (labeled with dates and times). Points of concern/values at risk/MMAs/M.A.P.s. Outline of information provided in briefings. Fire behavior forecasts (validated) and any updates or supplements. Document actual conditions and fire activity. Specific events (with time frames). Change from wildland fire use to wildfire; time frames. Unforecasted weather events and resulting impacts on fire behavior. Special or specific operational plans. Reference materials used during the assignment. Sources of data and why particular data sets were used or not used. Risks assessed and why, and what the consequences may be. Notification (who/when/how) of changes in predictions. Fire Behavior Chronology and Narrative. The package needs to support and describe the rationale behind your recommendations and explain how you choose to deal with conflicting information. All information needs to have the incident name, date/time, your name, and any other pertinent information on it. All documents need to be in a format the can be preserved as required by national documentation standards. Any or all of the Fire Behavior Documentation may be produced and submitted in electronic format. Ensure, if the documentation is a mix of paper and electronic records, that the file naming conventions are consistent and that they are organized in a meaningful way. File formats are becoming less proprietary, but make sure that the format is in a common format and readily readable by other users and their computers. Highly formatted documents should be saved in PDF format as well as in the original. Document desktop software name, vendor, and version. Consider including the install file. Integrate files into the incident digital record and keep a copy of your submissions.